Spring practices are due to start at the end of the month and second year defensive coordinator Don Pellum can’t wait to get to work with his defense. Despite the loss of some major talent to the NFL draft Pellum sees veterans in the locker room ready to pick up where they left off last season. According to Chantel Jennings of ESPN.com the downsizing on defense is giving Pellum reason to believe that the Ducks can be even better than last year. Granted last year was a roller coaster on defense for the Ducks, with ups and downs for most of the regular season before bringing the hammer down in their rematch against Arizona in the Pac-12 Championship and the Seminoles in the Rose Bowl. The struggles returned in the National Championship game against Ohio State but now Pellum believes he has the answer to the Ducks defensive dilemma. With the creation of very specific defensive packages, highlighting the talent of specific players, Pellum will be limiting the options of the defense in order to address specific play-styles, he told Jennings that “last year we might have had three or four different things we could do. [This year] we are going to dial it down to one or two and be really really good at them.” A Ducks defense that has improved from the strong play we saw at the end of the season is a cause to worry for the rest of the country and a cause for celebration here in Duck country. While Pellum is faced with replacing players such as All-American corner Ifo Ekpre-Olomu, and the prolific pass rusher Arik Armstead he will have plenty of returning players that saw work last year in light of injuries to the defense. 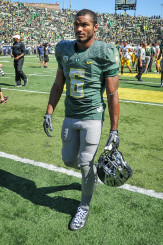 Chris Seisay a redshirt sophomore got some playing time at the end of the season when Ekpre-Olomu got injured, Deforest Buckner will be back on the line chasing down quarterbacks and there have been rumors that Charles Nelson could see some time on defense, contributing his propensity for hard hitting we have seen on special teams. In addition to the returning players, the Ducks successfully recruited impressive talent to bolster the defense. A high school friend of Buckner, Canton Kaumatule is a five star recruit that enrolled at Oregon early in order to be ready for spring practices. 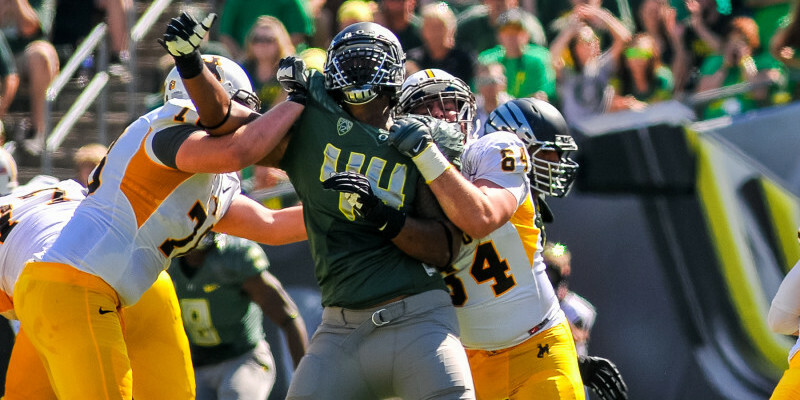 The 6′ 7″ defensive lineman should be an immediate asset and a new partner for Bucker in lieu of Armstead. Head Coach Mark Helfrich holds to the belief that the second time you do something, you should do it better. That idea has resonated with Pellum, he believes that his second year as defensive coordinator is going to be a successful one, running new schemes with returning players. We will soon see if the downsize has been a detriment or a catalyst for a rejuvenated system.